The advanced training features on the SportsArt Fitness C521u Upright Cycle puts it in a class far above its $1700 price tag. 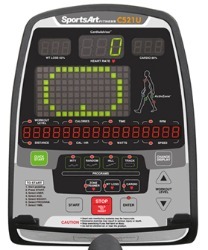 The tri-color dot-matrix display multiple LED windows give feedback information for time, distance, speed, calories, calories per hour, RPM, Watts, resistance level, and heart rate. The pre-set workouts include Hills (3), Intervals (2), Manual/Track, Random (10K), Cardio HRC, Weight Loss HRC, and ZoneTrainer™ with a custom heart rate program. The light commercial SportsArt Fitness C521u Upright Cycle features nearly silent electromagnetic resistance and a smooth flywheel for a pleasurable workout experience. This model has a self-generating power supply so it requires no cord or plug-in; simple get on and pedal or press Start. There is a back-up battery that will continue to light the display along with your workout stats for two minutes after you stop pedaling. The cycle seat is padded and oversized. It can be adjusted up and down as well as fore and aft for correct knee alignment over the pedals. If you prefer, you can add your own bicycle seat on the post using an optional seat adaptor. Other features of the SportsArt Fitness C521u are wireless telemetry monitoring, a low profile shroud for easy user mounting and dismounting, standard pedals with straps, a bookrack, and a water bottle holder. The CardioAdvisor™ feature illustrates your heart rate, and the weight loss and cardio workouts are both heart rate control programs where the resistance on the bike automatically adjusts to keep you in the proper target heart rate zone. You can use the ZoneTrainer™ feature while in any other workout program by pressing the ZT key and the resistance will adjust automatically to maintain your current target heart rate. The SportsArt Fitness C521u gets good reviews for its exceptional styling, design, comfortable seat, and ergonomic fit. This upright cycle has the same frame and console as the C532u model that sells for a few hundred more and that model comes with contact HR sensors on the handlebars and a longer warranty. These bikes are rated as light commercial models so they are also for use in hotels and corporate gyms (or in any “no-fee” facility) for use up to 6 hours a day. If it can handle that kind of daily workout, it will offer you years of quality use at home. 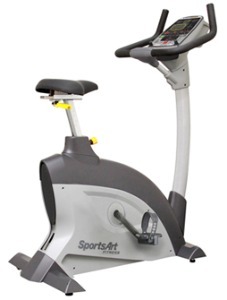 If you can find the SportsArt Fitness C521u Upright Cycle for around $1,500, it’s a Good Buy.